Much like your regular doctor visits to make sure you’re remaining as healthy as possible, periodic maintenance services for your garage door will ensure that it’s functioning as it should and will last you for a long time. Parts are bound to wear down over the years from constant daily use, but the sooner you catch the problem and get it taken care of, the better it is for the system! Continuing to allow the door to function with faulty parts creates strain that can ruin other components and may even cause a sudden and complete break that leaves you stuck, so it’s best to tend to it now, rather than later! 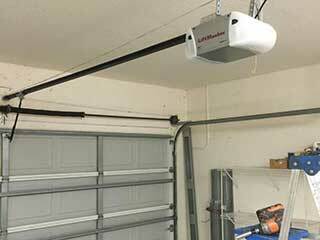 One of the most important parts of your garage door’s system is the safety sensors, which tell your door if something has moved under it while it’s closing so it will stop and reverse. Particularly if you have children or pets around the home, you want these sensors to be working as perfectly as possible to keep them protected! Our technicians will do a careful examination and testing to determine if the sensors are angled and functioning as they should be. That way you won’t have to worry and can rest easy knowing that your door is safe for use! The tension of your garage door is important to how well it will function, and how much you can count on it to do what you want! If the tension is too loose, the door can wind up off balance and put stress on the springs, causing them to wear out much faster so they’re more likely to break. However, too much tension is just as bad, as it causes the door to not close properly. This leaves your belongings, and your home, open to intruders. Our experts can take care of the problem easily by adjusting the tension right away! Contact Garage Door Repair White Plains to schedule your appointment!